The 2018/19 season has now come and gone and we have added to the Club’s trophy cabinet with 2 Premierships. Our 3rd Grade became Premiers with a hard fought draw against Burwood and being the higher placed team was able to lift the trophy by late Sunday. After arriving at a rain-sodden outfield at Airey on Saturday when our Club President rashly announced that not a ball would be bowled, the super sopper work put in by both teams defied the odds and a start was made at 4.30pm to see an improbable 28 overs played. Burwood took advantage of the sloppy conditions to march to 2/70 overnight. Come Sunday, with the conditions much improved , the gorillas immediately took charge to rattle through Burwood’s top order to see our opponents on the ropes at 6/79. James Redman and Dipen Patel shared the early wickets. Burwood rallied as you’d imagined they would, but with Dipen wheeling away for 24 overs and James returning, wickets began to fall again until we had all 10 Burwood batsmen back in the pavilion for 153. Dipen took the bowling honours with 5/45, while James finished his 24 over spell with 3/38. 70 overs were left to either get the runs and draw the match. Things got off to a shaky start with Fahad Mohammed standing firm, but the loss of a couple more early wickets we reached the Tea break at a wobbly 3/56 off 41 overs. Fahad continued but when he eventually went for 33 it was left to George Sacco and James Redman to carry on. George was proving a brick wall for the Burwood bowlers while James kerbed his attacking nature to play his most responsible innings. These 2 batted on and on into safer waters until George’s 34 over vigil came to and end with half an hour of play left. James carried on and with a gorilla cheer behind every dot ball, bowled stumps were drawn at 5.30pm with the Gorillas 5/135. James remained 46no and was awarded the Player of the Match medal. A Draw. Good enough to raise the JB Hollander trophy again after a 4 year absence. Our 3rd premiership in 3rd Grade and our 19th overall. Our 4th Grade were in the opposite situation with a win necessary to gain the 4th Grade Premiership against Burwood at Rothwell Park. Again Friday night’s downpour was a major factor in the match’s outcome with play restricted to only 8 overs on Saturday. It was a frustrating day with a cautious umpires delaying the start unnecessarily . Put it this way, Rothwell was a lot better condition that Airey and yet commenced an hour later. Despite our frustration we did gain something on Saturday with a wicket on the last ball that left Burwood 1/18 overnight. Early wickets on Sunday to Abhishek Nahar and Satinder put us in a great position with Burwood struggling at 5/64. It was at this point that our day of frustration kicked in. A couple of veterans took advantage of some poor catching, riding their luck as we fumbled several chances. As our position was one of having to force a win and Burwood having the luxury of just batting as long as they could , the trophy slipped further away as each over went by and each chance went begging. To our bowler’s credit we kept plugging away in the hope of the extraordinary happening. Our skipper, Satinder, tried swinging our bowlers around but we couldn’t get breakthrough until after Tea when Burwood had all but put the match to bed with more than 200 on the board. The remainder of their batting took advantage of a tiring attack but we stuck to our task until stumps with our opponents 8/264. Abhishek took the bowling honours with 3/50 while Raja and Satinder took 2 each. 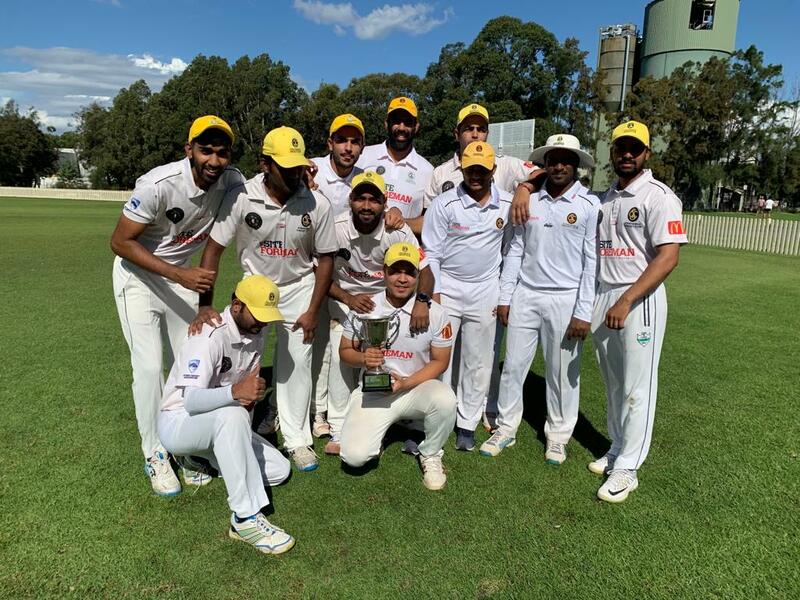 Out TCC cup boys were declared Joint Premiers along with Balmain/South Sydney when Friday night’s rain made any play impossible at Alan Davidson. Despite efforts to get something going with super soppering it soon became obvious that no play was going to be the result, with Joint Premiers the order. It was a great season for our TCC team and while a sole premiership would have been ideal , half a trophy was a better result than it could have been, given that we were the lower placed team. Overall, a really rewarding season with 2 Premierships. Now to a much needed spell. So we have 6 months to recover and look forward to something similar or even better in 2019/20 – 37 seasons and still going strong.